If a cleaner, softer, even complexion is your goal - DermaFrac is for you! This exciting treatment is a fully customized combination of microdermabrasion, mirconeedling, deep tissue serum infusion and LED therapy. DermaFrac uses a roller with 180 super fine needles that gently puncture the top layers of the skin. A Microchannel is left, which allow a peptide solution to simultaneously penetrate the skin leaving you with glowing, younger looking skin. New collagen production is promoted from this procedure meaning your skin will heal quicker. DermaFrac dramatically improves fine lines and wrinkles, UV damage, ageing skin, brown sports, pigmentation, enlarged pore, mild acne scarring, oily acne prone skin, stretch marks, epidermal density and strength. This procedure is more effective than fractional laser or chemical peel treatments. Does this treatment help acne? Yes! DermaFrac works to open pores, destroy bacteria, exfoliate your skin and increase collagen production with a combination of lactic acid and salicylic acid. Each of the four sub-procedures (microdermabrasion, micro-needling, serums and LED therapy) deals with a specific element of an acne outbreak. Not only does this popular treatment help to treat acne, it works to remove any annoying scarring that is left behind. This treatment is pain free! Patients have reported that though there isn't any significant pain, it does feel like more of an intense workout compared to other facials. DremaFrac is a great alternative to other painful laser treatments that can be more expensive and complicated. Many clients fine DermaFrac to be a soothing experience! Will I have significant down time? This treatment does not require any recovery time afterwards or any anesthesia during. You are able to return to your day to day activities immediately after the procedure. Slight redness or faint tiny scratches may remain after the treatment all depending on your skin's sensitivity, these after effects will fade within a couple of hours. To ensure the best results it is advised to refrain from wearing make up after the procedure for the evening. 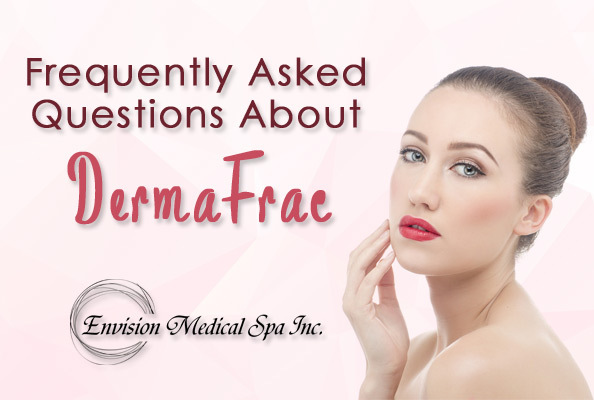 Typically DermaFrac is administered to a client in six treatment sessions every two weeks after the first round. Customized treatment schedules will be created depending on each person's unique and specific needs. Once a full treatment course has been completed, it is recommended that a maintenance program is put into place meaning that you would come in for a touch up regularly. Is there anyone who cannot have this treatment? Pregnant women, women who are currently breast feeding and patients who are on medications that specifically say to refrain from micro-needling should not go through with this procedure. If you plan on traveling to a tropical destination or spending long periods of time in direct sunlight make sure to wear a high SPF sunscreen for up to two weeks after the treatment since your skin will be extremely sensitive. Reach your skin care goals with us! Contact 780-986-8352 to book your free consultation today.